Latest Design Option 2-2, Remodeled Kitchen » Roger Perron Inc. The cooking center of the remodeled kitchen is so nicely detailed per the owner’s feelings and taste and is just what she likes! 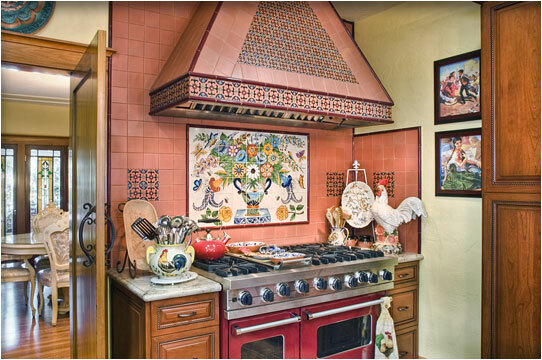 The Viking stove with a custom tile hood makes for a unique remodeled kitchen, with Mexican motif, which exudes the owner’s personal tastes. This photo represents a unique blend of tiles, mural, appliance, and granite combinations. The double active swing door leads to the dining room.